A happy accident when one recipe turned into the most delicious Slow Cooker or Instant Pot Smothered BBQ Beef Burritos! The creamy salsa verde sauce is amazing! Listen, this whole instant pot thing is getting crazy, and we are totally on board. But that doesn’t mean that we’ve forgotten the awesomeness of a slow cooker. 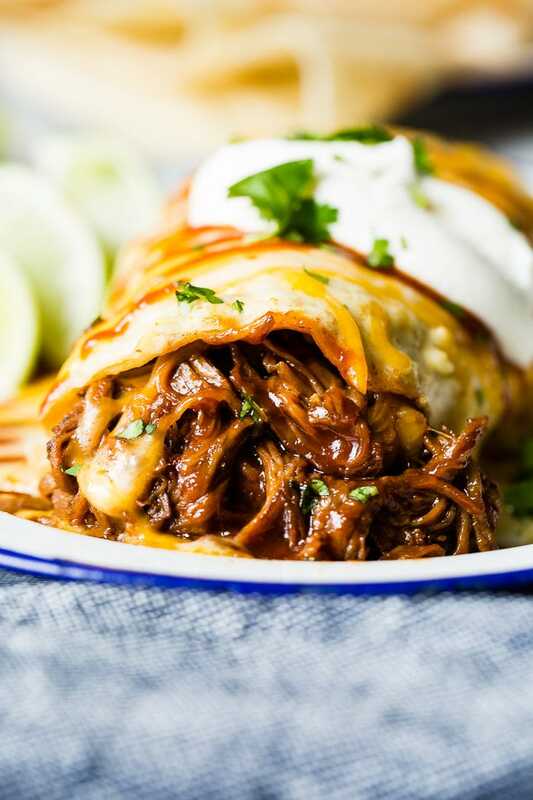 Yes, this is extra work to develop, test and write a recipe for two different cooking methods, but we think you are absolutely going to love our Slow Cooker or Instant Pot Smothered BBQ Beef Burritos! Alright, here’s what happened. I had originally set out to make an instant pot shredded chicken recipe, but last minute ended up switching things up and using rotisserie chicken. So when I saw our beef roast in the fridge waiting to be cooked the next day I decided to wing it and threw it in the crock pot with what I thought was taco seasoning. We make our own Homemade Taco Seasoning which I usually store in a jar in our cupboard (ps, have you caught on to this whole spicy shelf craze? I’m OBSESSED with ours), but we had leftover Smoky BBQ rub from Cade’s Carolina Pulled pork so without checking I pulled it down, sprinkled it all over and plopped that baby in the instant pot. An hour and a half later the most delicious meat came out, but it wasn’t what I expected, it was shredded BBQ beef and it was yummy! I added our favorite Homemade BBQ sauce and texted my cute friend, Jen from Carlsbad Cravings who is the QUEEN of photographing burritos and Mexican food. She gave some amazing tips and while I need to practice WAY more, I set out to photograph our instant pot bbq beef burrito. But it was missing something, so I added a creamy salsa verde sauce just like our Honey Lime Chicken Enchiladas. IT’S SO GOOD!!! I can’t even explain it! It totally works!!! 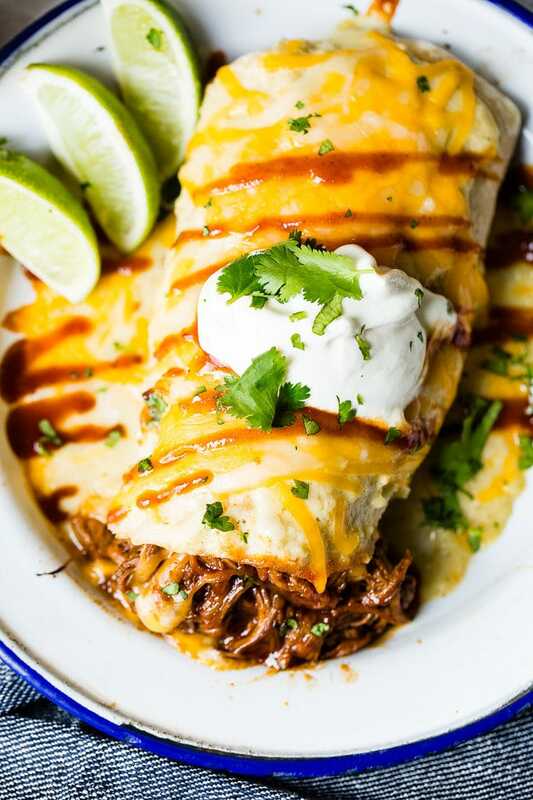 These Slow Cooker or Instant Pot Smothered BBQ Beef Burritos are our new favorite for #tacotuesday even if it’s not a taco recipe! Well, what roast for shredded beef is a good question, but you can make most roasts work, it’s the beef chuck roast that we’ve found does the best. If you have a tri-tip roast that will also work. Make sure you have good marbling, but that the roast isn’t overly fatty. The meat should also be a nice red and not grey at all so make sure you check the meat before buying it. A grayish tone means the meat is old or has not been kept at a proper temperature. There are only two ways to make shredded beef that is tender and delicious without going outside to a grill or smoker and that’s the slow cooker or the instant pot. If you’re looking for how to make shredded beef fast then you need and instant pot. In fact, you’re going to want this 6 QT 9 Function Instant Pot or the 8QT 7 Function Instant Pot in order to fit a whole beef roast. It only takes 70 minutes to make shredded bbq beef in an instant pot, and you don’t even need any liquid other than the bbq sauce which you’ll toss that tender beef in at the very end. Rub your BBQ Rub all over the beef and place it in the Instant Pot. Turn it on to high pressure and cook for 70 minutes. Once the time is up, let is slow release the pressure for 10-15 minutes and then take the beef out onto a cutting board, and using two forks, shred the beef. Place back in the instant pot and toss with bbq sauce to taste. To make shredded bbq beef in a slow cooker or crock pot, do everything the same as the instant pot, but set it to low and allow the beef to cook for 8 hours. Remove the meat from the slow cooker, keeping it on low, and shred the meat. Add it back into the slow cooker with the bbq sauce and toss to coat. We use the Hamilton Beach Programmable Slow Cooker. Once you’ve decided on shredded beef the next question is always how much shredded beef per person. The general rule is about 1/2 lb per person, but you should definitely take into account who’s eating. If it’s small children you can cut that number in half again, but if it’s an adult male you may want to plan on a stitch more. Shredded bbq beef is one of my favorite meals to freeze. You’ll notice when you defrost it that the fat has solidified again, but that’s perfectly normal and great for re-heating as it will help to keep the meat moist. As always, we prefer to freeze all meats using a Food Saver. No, we don’t work for them at all, so this isn’t sponsored, but it really is one of the best investments you can make for your home. Alright, finally it’s time to assemble. The shredded beef is great on its own, but when you add a little cheese things start to get incredible. Roll it all up in the best tortillas you can find and then whisk together a simple, creamy salsa verde using heavy whipping cream and Herdez Salsa Verde in the jar. Pour that over the burrito and sprinkle on a little more cheese. Place the entire burrito on a dish and put it under the broiler to melt the cheese. 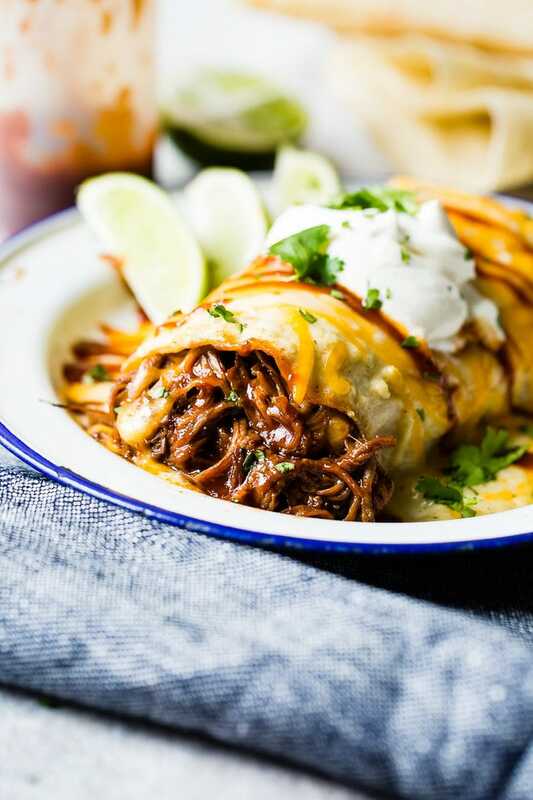 Serve our Slow Cooker or Instant Pot Smothered BBQ Beef Burritos with a little dollop of sour cream and enjoy! Rub the beef all over with the rub and discard any remaining rub. Place the beef in the instant pot with the vinegar and broth and turn it on to manual, high pressure for 70 minutes. Once finished, allow the slow release for 10-15 minutes. Remove the meat to a pan or cutting board and shred the meat. Place the meat and the bbq sauce in the instant pot and stir to coat. Place the lid back on while you prepare the other ingredients. Prepare the beef as stated above and place in a slow cooker on low for 8 hours. This may seem like a long time but it will lead to the most moist and tender beef ever. Remove the roast, shred the meat and place back in the slow cooker with the BBQ sauce, stirring to coat. In a blender, pulse together the verde and heavy cream until smooth. Place the beef and some shredded cheese in a warmed and pliable tortilla. Fold in the ends and roll tightly closed. Place on a baking sheet. Cover each burrito with sauce and cheese and broil until the cheese is melted. 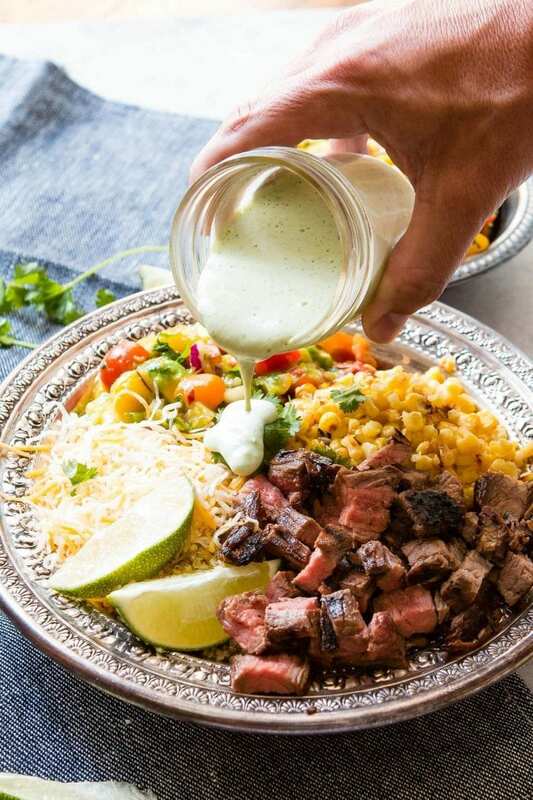 Easy Grilled Steak Burrito Bowls are great for easy meal prep recipes full of corn, quinoa, a killer mango avocado salsa and more!